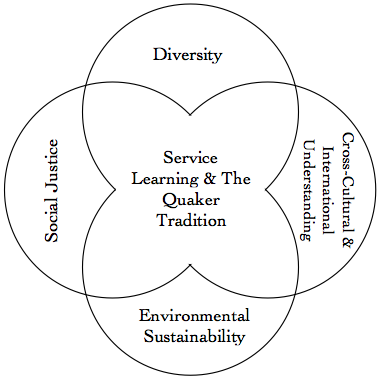 QUEST is the Quaker Center for Understanding, Engagement, and Stewardship, and was established in 2009 to provide leadership and an administrative structure for programs that express and build upon distinctive strengths of Quaker education: cross-cultural and international understanding, social justice, diversity, and environmental stewardship all within the context of service learning. The goal of QUEST is to focus on student development of global thinking skills, active engagement in issues, and confidence as global stewards and leaders. The QUEST Term Service/Leadership Experience engages students in an experiential learning model to increase their understanding of global issues as well as strategies to mitigate the impact of these challenges. During the summers preceding their 10th, 11th, and 12th grade years, students may elect to travel to domestic or international destinations to engage in global issues and leadership. In June of 2018, in partnership with the World Leadership School, students traveled to El Paso, Texas, for an examination of worldwide immigration issues through the lens of the U.S.-Mexico border. In this program, students saw first-hand the government agencies responsible for controlling the border, including the US Border Patrol. Students also met the leaders of a network of non-profit agencies that provide shelter, food, legal aid, and other services to illegal migrants. In partnership with Cristo Rey Lutheran Church, students provided community service and witnessed the impact of their service to the poorest of the poor and the most vulnerable in the El Paso-Juarez border community. The group visited the Colonias--unincorporated settlements outside of the city limits that have very few government services (no electricity or potable water, for example)-- to meet with residents to hear their stories and to tour the area to witness the living conditions. In June of 2017, 20 students and three chaperones returned for our third QUEST visit to Cabarete in the Dominican Republic. The group collaborated with the DREAM Foundation to repair areas of a local school and teach at a literacy camp for young learners. The DREAM foundation offers educational programming throughout the northern region of the country and WFS enjoys a strong relationship with the non-profit organization. Students raised over $1000 during the WFS Spring Fling event to contribute to DREAM. Click here to read about all of our summer 2018 student travel experiences and global education at Friends. QUEST Scholars Program The QUEST Scholars program provides Wilmington Friends School students with significant mission-based program opportunities that combine academic studies with experiential learning. Students may choose to be a scholar in one of these areas–or in a combination of areas (e.g., Global Studies and Service Scholar): QUEST Diversity Scholar QUEST Global Studies Scholar QUEST Service Learning Scholar QUEST Spiritual Life Scholar QUEST Sustainability Scholar All WFS upper school students are eligible for participation in the QUEST Scholars program. In applying for participation, each potential QUEST Scholar develops a program proposal. In doing so, the student works with the appropriate adults (in school and in the broader community) to develop a plan to meet the requirements of the particular QUEST Scholar program. The proposal is submitted to the QUEST director and reviewed and approved by the members of the QUEST committee. With completion of the proposed program, the Scholar provides the QUEST director with evidence from the school programs and outside programs of participation in–and contributions to–the elements of the Scholar’s chosen plan. The members of the QUEST committee review the student’s engagement in all proposed activities and recommend to the head of upper school the names of those who have met the requirements successfully. With the approval of the head of school, these QUEST Scholars receive recognition for their achievement during final assembly, and the student’s transcript indicates the student’s achievement as a QUEST Scholar. The QUEST Big Ideas Speaker Series, Lunch & Learns, and the Home & School Parents for Multiculturalism Movie Night are forums in which we can bring in leaders and experts of all kinds to meet directly with students. Students have the opportunity to interact one-on-one with people they may have not had the chance to meet otherwise, from Nobel Prize winners, to best-selling authors, to holocaust survivors, to musicians.